(Kids 33" Chest) Ugly Xmas Sweater Vest! Silly Snowman Totem & One Snowman Watching! 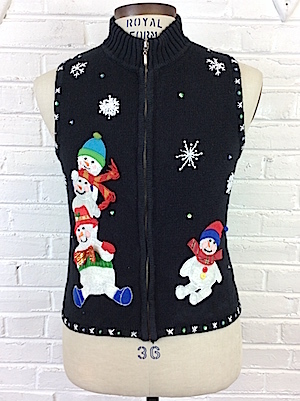 Home > Items just added 4/3-4/17 > (Kids 33" Chest) Ugly Xmas Sweater Vest! Silly Snowman Totem & One Snowman Watching! Ugly Christmas sweater vest! Black knit with a totem of cute little snowmen on one side w/ one little snowman observing from the ground. Snowmen are all decked out in hats, scarves, shiny bows, real beads and buttons! Embroidered snowflakes fall behind them. Armholes and bottom of the sweater are trimmer with embroidered snowflakes and sequins. Has one more snowman head and snowflakes on the upper back of the vest. Closes in the front with a zipper. Closes in the front with green knit covered buttons. Tagged by Mercer Street Studios . Ramie/Cotton blend. Condition: Very Good. Missing a few sequins and has a few loose threads. Does not detract from the awesomeness of this sweater!